Mosses as pioneer species and indicators. While we are probably all aware that there is a great variety of wild flowering plants around us (approximately 1,500 species in Britain), you may be surprised to learn that there are almost as many Bryophytes! There are well over 1,100 different species of mosses and liverworts in Britain, with nearly 900 of these being mosses. Even within a relatively small area such as the Woodland Education Centre, over 100 species of mosses and liverworts have been recorded. There will be any number of different species in your backyard too, yet because they tend to be more on toe level than eye level, they are easily overlooked. This is a shame, because, as with many things in the natural world, once you begin to look a bit more closely, truly fascinating ways of life emerge. One other unfortunate consequence of their cryptic nature is that most mosses can only be identified by tongue-twisting Latin names. Because they are less well observed and noticed, few have widely accepted common names,. Their low growth form and usually small size also means that the importance of mosses in ecological terms is often overlooked. I was astonished to find that mosses were among the earliest colonizers of bare ground recently cleared of rhododendron. I discovered this some years ago, while surveying the newly de-infested birch woodland in the Woodland Project area at the Centre. I had always assumed that mosses were slow-growing and had not considered them to be pioneer species. 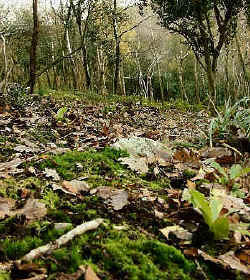 Yet in this woodland situation, a variety of mosses became well-established on the cleared woodland floor, long before the flowering plants. The developing mossy carpets also provided important new microhabitats for an extraordinary variety of invertebrate life. This ranged from fly larvae, slugs and snails, to mites, pseudoscorpions and spiders. In wet conditions, the moss acts like a sponge, providing semi-aquatic conditions for a whole variety of other minute creatures, as well as a wonderfully damp nursery for germinating tree seedlings and other flowering plants. Mosses can also be extremely useful as habitat indicators. For instance - forget the pH testing kit for your garden soil - finding a particular species of moss could help you decide whether you should be growing azaleas or anemones! Many mosses have very distinct preferences for either acid or alkaline soils. For example, like anemones, mosses such as Tortella tortuosa and Neckera crispa prefer soils with a high lime content and pH. Others such as Campylopus paradoxus favour acidic soils, while Sphagnum moss can thrive in bogs with a soil pH as low as 3.5. However, look carefully! You might actually have very acid soil, yet still find a lime-loving moss species happily growing. This can happen where small chunks of cement, masonry or similar stone are present. The small size of most mosses means that these lime islands can be independently colonized by lime-loving species, while the surrounding acid soil supports its own complement of acid-loving species. In practice, a certain degree of knowledge and familiarity with mosses is needed for them to be useful as habitat indicators. Identifying individual species can be a very specialist task. Some mosses look superficially very similar, yet prove to be completely different when looked at using a hand lens or a microscope. Other closely related species can sometimes only be separated on microscopic cellular differences. 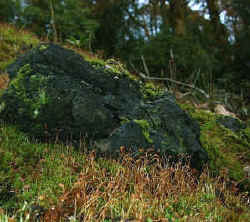 The same moss can also have a quite different general appearance, depending on its growth stage or how dry it is. Dont be put off though! There are many commonly occurring mosses which are distinctive enough to be readily identified by anyone with a general interest and a hand lens. 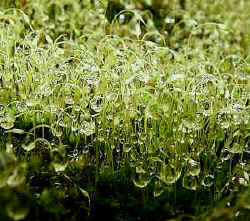 Their ecology is fascinating and on close examination, many mosses are extraordinarily beautiful. Running your fingers over compact shining carpets of moss can also be a wonderfully tactile experience. The really challenging identifications can be ignored until later. *Thanks to Dr Sean Edwards, Keeper of Botany at the Manchester Museum, for kindly supplying some identifications and common names of the mosses pictured above.